Previously I wrote about how I’m modelling opinions and prejudice in Sol Trader. It’s time to put some of that information to use. The opinions a character has of other people, based on the partial events that they know about them, will now directly affect the things that happen in the history generation. This creates new events, which will in turn feed more character opinions. There’s a new beta available on the forums if you have insider access. 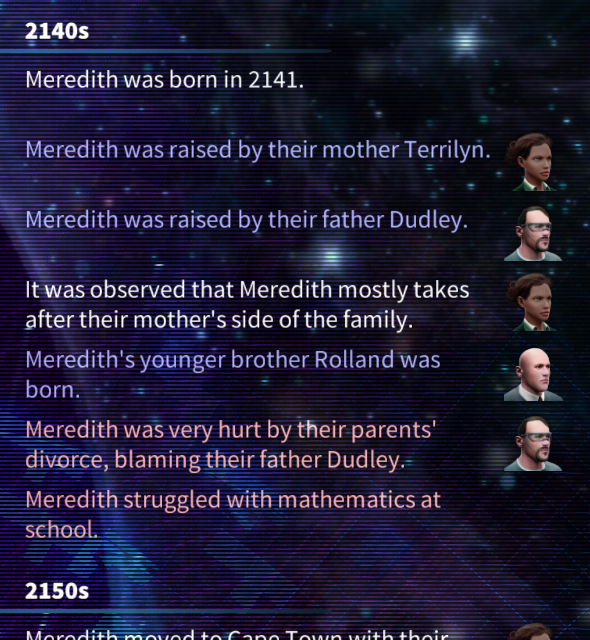 In the example on the left, we can see that an acrimonious divorce of Meredith’s parents has left an indelible mark on her childhood. She now has a very low opinion of her father, Dudley. When characters are adults, they can then generate a series of ‘favours’ (or ‘missions’) that they want completed. This is a source of work for the players, although completing certain missions does have real consequences on your relationships with the target of the mission. If they find out you’ve taken a mission against them, then they won’t be happy with you. To continue our example, Meredith, whom we are now married to, wants us to find out some potentially incriminating information about our own father-in-law, Dudley. It’s up to us whether we take it or not. If he finds out, we’ll make an enemy of him. Is it worth getting involved in this feud? 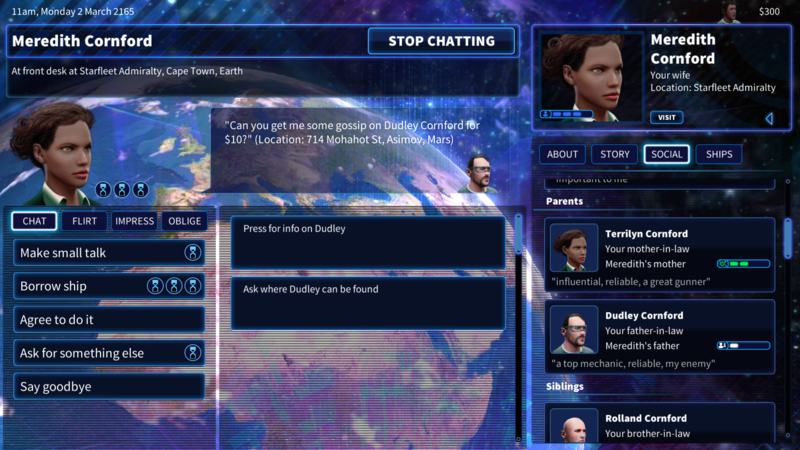 As the game goes on, the player will get embroiled in these relationships between the various characters and be able to directly affect their stories. Choosing what to take on and who to ally yourself with forms a major part of Sol Trader’s gameplay. Another example: the sad tale of Sarina, our older half sister. I picked Dagny and Warren in history generation to be my character’s parents, knowing that Dagny was cheating on her husband Hayden, mostly to see what happened. Little did I know how much it would affect Sarina, Dagny and Hayden’s eight year old daughter. When she found out about my birth, she got very upset. She didn’t blame me, thankfully, although she never thought much of me. However, she never really spoke to our mother again, especially since her beloved father Hayden died soon after we were born. She left home at a young age, and became a political assistant, but she didn’t make too many friends. She was doing ok for a time, only to find out that the love of her life, Richard Ruhr, had been having an affair behind her back all along. She divorced him, got depressed, quit her job and by the time I grew to adulthood at the start of the game, she was living in a hippie commune somewhere on Mercury, trying desperately to get some gossip on her ex-husband. This new beta is now available from the forum if you have purchased insider access (if you haven’t there’s still time.) Let me know if you find any other interesting stories such as these!